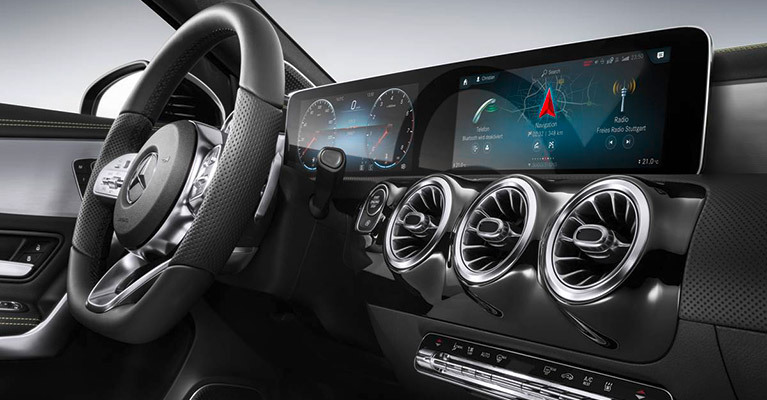 Mercedes-Benz has recently revealed an innovative and superior infotainment system for their vehicles. The company announced the technology earlier this month at the Las Vegas Consumer Electronics Show. Dubbed the Mercedes-Benz User Experience, MBUX for short, the technology easily surpasses the infotainment systems found in other high-end vehicle companies. Other luxury vehicle companies have paired with Amazon Alexa and Google Assistant when creating their AI systems. In the past, Mercedes has received criticism for their complex and rotary controlled infotainment system, Command. In response to the criticism, Mercedes took matters into their own hands by developing a system unlike anything consumer AI has seen so far. Unlike Amazon Alexa and Google Assistant, MBUX is a next-generation interactive experience. The best way to describe MBUX is an experience, not a system. It is all-encompassing, user-friendly, and rivals a human personal assistant. Designers of the system actively worked to create an intuitive experience for car and driver. The Mercedes name has been synonymous with luxury since its inception. With the addition of the MBUX system, the company is well on its way to becoming a leader in next-generation technology. The MBUX system is unique in its ability to learn about the user. For example, if a driver calls his or his spouse every day on their way home from work, the system will make a suggestion at the appropriate time to make a call. The same is true for the mapping system. If a driver takes the same route to work each day, the map will set the navigation to the destination, also providing real-time traffic updates along the way. Indirect speech is an innovative highlight of MBUX. Competitor’s systems require a user to say specifically, “Set temperature to 65 degrees.” The Mercedes system is more interactive, requiring something along the lines of, “Hey Mercedes, I’m cold.” The system responds by slowly increasing the temperature in the vehicle. The same aspect works for weather. During the show, one Mercedes executive asked, “Can I wear flip-flops tomorrow?” The ability of the system to respond to indirect language is the pride of Mercedes developers, for good reason. The system is also very adept at understanding non-native speakers. The navigation sensors on the outside of the vehicle seem to be lifted from a science fiction movie. Instead of loading the system with an ordinary mapping system, MBUX works on HERE map data. From there, navigation turns into an augmented reality, superimposing images from the front camera onto the navigation display. Arrows or house numbers will appear directly on the touchscreen, taking you directly to your destination. Other navigation services include fuel prices at approaching gas stations, parking locations and costs, available parking spaces with a calculated likelihood of availability. At the present time the navigation system requires manual updates. Soon the manual system will be updated with over-air updates. Mercedes Me is an app being launched with MBUX. The system is installed on a driver’s smart phone. The app will then assist with vehicle location in crowded parking areas or if your vehicle has been stolen. Other systems have similar apps, but once again, MBUX goes further. If the parked vehicle is bumped into or towed away, the driver will receive a notification via Mercedes Me. The system also syncs with your smartphone calendar. If a driver has a meeting in one hour, the app will notify the driver when it is time to leave, taking into account current traffic conditions. Many of the improvements implemented came on the heels of a report that showed the average age of the European Mercedes driver has dropped by 13 years. The highest number of younger drivers own the compact class, so it’s no coincidence that is the first group to see the MBUX system installed. What better way to attract younger drivers than with interactive AI? In addition to the millennial-friendly MBUX system, the company has also updated the interiors of the compact class. A curvy new modern dashboard has replaced the older, more conservative design. Ambient lighting has been added to the interior, along with sporty air vents. The best way to describe the new interior is “modern luxury,” and it is combined with what millennials desire most: user experience personalization. MBUX will be launched this spring along with the company’s compact vehicles. There will initially be a limited release with the A-Class hatchback in Europe. The U.S. models will most likely be available by fall of 2018. The Mercedes brand has always been strong in the US. With the addition of MBUX and the sleek new interior, it is likely younger U.S. drivers will flock to dealerships. Mercedes has truly created a next-level driving experience.